Past: Flying Legends of Victory Tour Featuring B-25 Bomber "Maid in the Shade"
The type of fast, muscular aircraft made famous in the 1942 Doolittle Raid during WWII will be on public exhibition at the Cape Girardeau Regional Airport June 18 - 24, 2018. 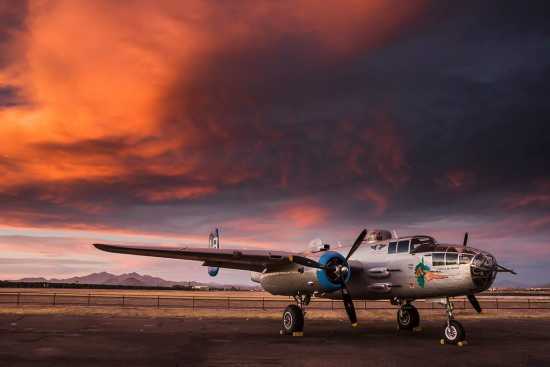 The B-25J 'Maid in the Shade' is one of the Arizona Commemorative Air Force's combat aircraft based at its world-famous museum based in Mesa, Arizona. Tour Hours: Monday, Friday - Sunday: 2 p.m. - 6 p.m. and Tuesday - Thursday: 9 a.m. - 6 p.m. Standard plane tour fees are $10/person and $20/family of four (in US and Canada) but may vary by tour location. Rides in the aircraft will be offered Friday - Sunday from 10 a.m. - 1 p.m. for $325 USD (waist gunner seats) or $650 USD (jump seats in nose). Reserve your seat today by visiting http://bit.ly/FLOVTCapeGiradeauMO or calling 480-462-2992. Age minimum 12.